We understand your need to help your loved one stay at home. 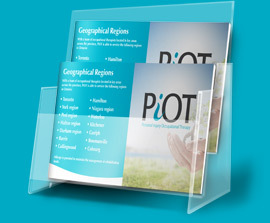 PiOT provides seniors and their families the option of privately hiring a company to deliver a variety of services including assessments and ongoing treatment programs to assist with the health of your loved one in a timely and efficient manner by a qualified, experienced Occupational Therapist or “OT” for short. Our goal is to provide timely and efficient assessment and treatment for seniors to keep them safe in all environments, optimize their function in their daily lives, and facilitate overall good health outcomes. Inquiries and referrals are sent to us by individuals, family member and health professionals in the community. Step by Step, here’s how we will work with you. or mail it to us by Canada Post. To start the process, click here to make an inquiry. 2. Once a referral request is received, there is an intake process to determine the main issues the client is facing and the primary reason for the referral. 3. Our PiOT Referral Coordinator will interview the contact person in order to tailor the service to the client’s needs. 4. An estimate of cost is prepared and emailed to the contact person for approval for the service. 5. We will assign an experienced occupational therapist to work with you. She will phone the contact person to arrange the first visit within three business days of receiving their intake form. 6. Your occupational therapist (OT) will provide the services as per the agreement, as discussed. 7. Based on the assessment(s) performed, a written recommendation and report. Resources for the client/family will be provided as appropriate. NOTE: We maintain a confidential client file, session notes are made after each visit as per the standards of our regulated college, the College of Occupational Therapists of Ontario. When you engage PiOT’s services, we can be paid by the client/individual, a family member, through insurance benefits, other funding agencies, or a combination. When the payments are being made by the client /their family, the payment or partial payment is paid to PiOT prior to the service (assessment or program) is delivered. The payment structure can be organized in blocks of sessions. This will be discussed with the contact person when the referral is initiated. If insurance benefits are available through your extended health insurance plan we can provide you with a receipt to get reimbursed for the service you receive. Payment options include cheque, PayPal or online e-transfer. A receipt for income purposes will be issued to the individual who PiOT works with, as per Revenue Canada, (not the family member paying)..
Navigate, coordinate and connect you with health community programs and services. Apply for funding programs as our team hasexperience to connect individuals with a wide variety of funding agencies to help cover the costs for assistive equipment and modifications.